A Cost Comparison of Transportation Modes. A study worth looking at. The following study is well worth a look as it dispels many currents myths about transit, especially the SkyTrain light-metro system. ‘Zwei’ notes that Professor Condon has fallen into the light rail/streetcar trap. 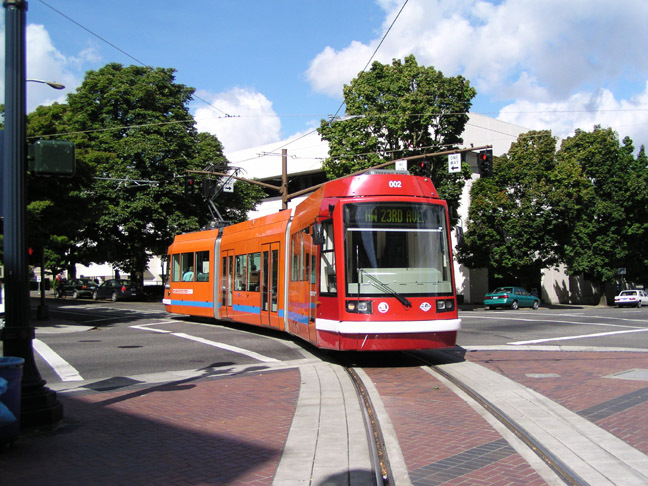 The difference between LRT and a streetcar is the quality of rights-of-way, where a streetcar operates on-street in mixed traffic, with little or no signal priority at intersections, while LRT is a streetcar that operates on a ‘reserved rights-of-way’ (RRoW), which is a a route reserved exclusively for a streetcar or tram and with signal priority at intersections. A RRoW can be as simple as a HOV lane with rails or as complex as a lawned boulevard RoW such as the Arbutus corridor. When a streetcar/tram operates on a grade separated RoW such as elevated on a viaduct or in a subway, in fact becomes a metro! Until academics, transit planners and bureaucrats start understanding that modern LRT/streetcar a independent transit mode that is built to provide different and unique transit solutions different from that of a metro and is not a poor-man’s SkyTrain, we will get the same monotonous, expensive and unworkable metro only planning that the region has suffered for the past three decades. This entry was posted on July 26, 2010 at 4:55 am and is filed under Uncategorized. You can follow any responses to this entry through the RSS 2.0 feed. You can leave a response, or trackback from your own site. From the country, where the streetcar at the picture was made: Here the streetcars share the lane with cars when within heritage centers, while further from it they have designated lane (LRT then?). What is more important, in all cases they get priority at intersections (by GPS), so even in shared lanes in rush hours they get you to place in time. The same may be achieved with buses, but those can never transport same numbers of people. And especially the comfort of the ride is totally different, not even the most modern buses can achive the comfort of 40 years old trams (if well maintaned), not to mention modern trams. Thanks for your look at the study. We DO need more clarity about what distinguishes streetcar from LR. Thats why i use the term tram to help open up a new discussion. When i use the term tram i mean a vehicle that weighs much less per unit length than the typical LR. However, i also mean a vehicle that is capable of going at speeds up to or greater than 70 kph, can be put in a tunnel if you like, can and should go on dedicated ROWs or dedicated lanes, should always have signal priority, and can attain speeds akin to or greater than that of the 99-B line while not compromising easy curbside access. Zweisystem replies: In North America what we take for modern light rail cars are quite old but well designed Siemens/Duewag U-2 tram car. Portland (licensed built), San Diego, Calgary, Edmonton are just some of the operators of this model which was originally designed for the Frankfort U-Bahn. These cars have a maximum speed of over 80 kph. The mistake made in North America about slower speed tram cars is based on the fact that a urban tram car, operating on a line with no steep grades and stops every 400 to 600 metres doesn’t need more expensive, larger motors that are capable of higher speeds, rather they have smaller cheaper motors with a maximum speed of 60 kph to 70 kph. The Inekon/Skoda cars used in Tacoma and Portland can also be equipped with larger, faster motors if operation demanded. Today, the modern modular car, (Bombardier Flexity, Siemens Combino, & Alstom Citadis) can be ordered in many packages, from small 3 section cars with smaller cheaper motors, to much longer faster cars with more expensive motors, capable of faster speeds. Some modular cars are now over 54 metres long (Budapest Caterpillar), yet have a maximum speed of 60 kph to 70 kph because the route doesn’t demand higher speeds. Some years ago, the Light Rail Transit Association had an article which said, “If a tram line had 40% or more of the line on a ‘Reserved Rights-of-Way’ it could be considered Light Rail or LRT. Zwei has taken this one step further by saying that the quality of rights of way, determines the mode. Thus a tram car operating on-street, would be called a streetcar; a tram operating on a on a reserved rights-of-way, would be called LRT; and a tram car operating as a commuter train would be called a TramTrain. Any transit line operating on grade separated line such as a viaduct or in a subway tunnel would be known as a metro. We now come to the final question; “How does one classify a Karlshrue zweisystem tram car?” The car operates on street, on its own RoW, and on the mainline railway, thus it can be known as a streetcar (tram), LRV or a train. The simple answer is, what we call it is not what the vehicle is, rather the quality of rights-of-way which it operates. Also, a simple streetcar, operating on-street, with no signal priority is about 5% faster than a bus. By adding a few stretches of RRoW at strategic points along the route and by adding priority signaling at intersections, could make the tram 30% to 40% faster than a bus. I do not think TransLink has ever factored in that calculation at all! Not a bad report Zwei, despite the deviations from accuracy. Has this report originted in BC? Zweisystem replies: Yes this report was done by UBC professer Patrick Condon. Your reply illuminates both the issue, and the reason why it is so confusing. This confusion gets in the way of coherent discussions about trams, streetcars, light rail and metro. Fundamentally agree that one vehicle can BE all of those on one trip. But admittedly that makes it very hard for citizens to get their heads around the issue, no? Even most transit planners have lots of trouble first understanding all of this, and then clearly communicating it. Zweisystem replies: Agreed, there is a lot of confusion. A lot of confusion arises because we cling to dated notions about transit that are repeated by planners, engineers and the media. The SkyTrain/metro lobby would have us believe that speed is the prime reason in attracting customers to transit. This is grossly over simplified to the point that a many would have us think that a metro with stops every 2 km. or so would attract huge amounts of new ridership. What ‘Zwei’ has read (Prof. Carmen Hass-Klaus Bus or light rail; making the right Choice) is that stops every 500m to 600m is the optimum spacing for LRT for attracting the most ridership. Then there is the transfer debate, with most studies pointing out that one can lose upwards of 70% of potential ridership per transfer. The Karlshrue TramTrain was first conceived to eliminate am inconvenient and time consuming transfer from commuter train to tram. A 473% increase in weekly ridership in just a few weeks clearly demonstrated the appeal of a no transfer journey. If we can get planners to think of streetcar as on-street operation in mixed traffic or LRT as a streetcar operating on a reserved RoW, we would go a long way to get us out of the present transit debacle. The concept is simple and would go a long way in reducing confusion. As for metro, it should only be built on routes that have sufficient ridership (300,000 to 400,000 passengers a day per route) to justify investment. Again, we must stop our transit planners from thinking that light rail is a poorman’s rapid SkyTrain; LRT and metro are two different transit modes built to solve two different transit problems.